This recipe is so perfect for the summer! You can bring it to the beach or a BBQ and everyone will love it. The best part is they won’t even know it’s healthy. Leftovers pack up for great lunches the next day. Enjoy! Make the pesto by placing all the ingredients in a blender and blending well until smooth. Set aside. Store leftovers in an airtight container in refrigerator. De-frost your peas by placing them in a bowl of hot water. Once soft, drain off water and set peas aside. Make your courgette noodles by either using a spiraliser or using a vegetable peeler and peeling off ribbons of courgette. Place in a bowl. 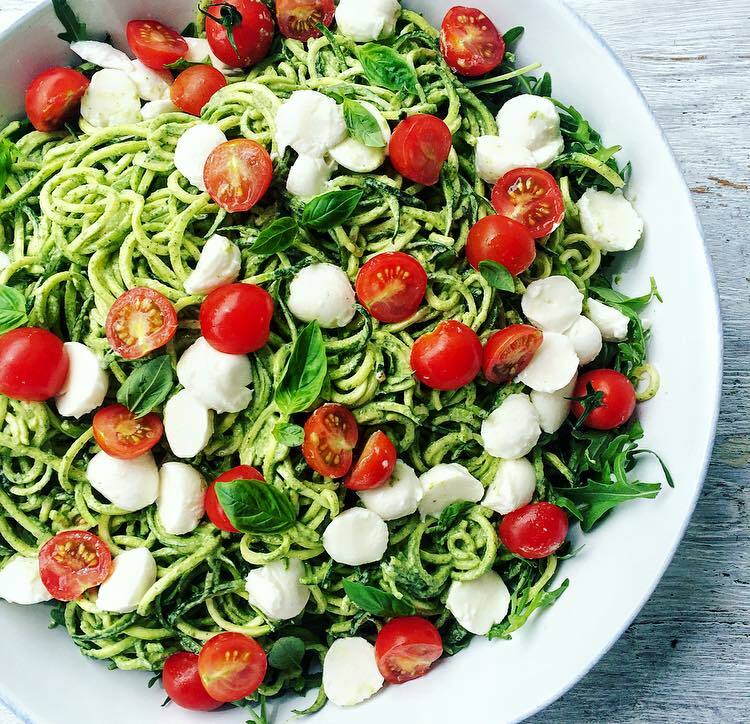 Add 1⁄4 -1⁄2 cup of pesto to the courgette noodles and mix well to completely coat noodles. Add the tomatoes, sun dried tomatoes and peas to the bowl of noodles. To serve, place the spinach or rocket on a plate and top with the courgette noodle mixture. Top with pine nuts, pumpkin seeds or mini mozzarella balls if you like. This recipe serves 2-3 people. If you want to make it for a large group, I like to allow 1/2-1 courgette per person when figuring out how much to make. 1/2 a courgette per person as a side dish, 1 per person as a main.